That's what 2 lbs of singles looks like. Baseball jersey, from "Knits Men Want ". Which, incredibly, they do! Gorgeous, right? I love how silvery it is. 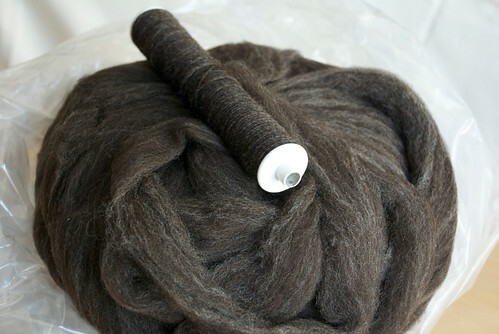 The fleece had AMAZING crimp, and was a joy to spin. My qualms are with how Zeilinger's processed it, leaving enough grease on it to make it smell rancid until I washed it again, myself. They also charged me extra weight (ahem, thumb on the scale, much?) on all three of the fleeces that they processed for me, and didn't bother to label which fleece was which, or how much finished weight I ended up with. I can't recommend them, sorry, Zeilinger's. The "up" side of re-washing it is that I can enthusiastically recommend the unscented SOAK for getting nasty, stinky, rancid lanolin out of wool without stripping it completely dry. Way to go, SOAK! Makes you want to reach out and touch, I know. I wish I had gotten a picture of the fleece pre-processing, it had the most INCREDIBLE stark white skunk streak running through it. (I have an auntie who went grey the same way, and every time I see a streak that defined, I think of her hair.) You can see it in the picture above, with the locks I pulled from the fleece. Blended and pindrafted, I love how it creates a heathered effect in the singles. I would love this fleece in a box with a fox, in a house with a mouse, or in this case, in a sweater for cooler weather. The swatches have actually been done for almost a month, and Andrew asked what the hold-up was. The singles have been sitting on the coffee table for *approximately* the same length of time, being gorgeous and single. You know how they are, smug little things. 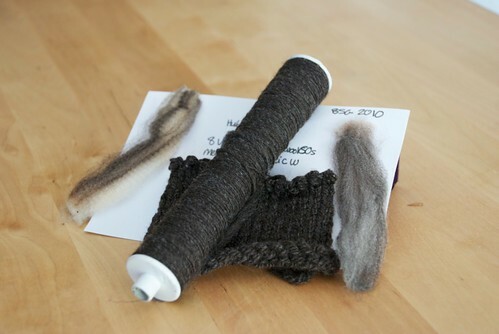 I told him that I couldn't ply the sweater until I took pictures of the singles for Ravelry. (Along with being gorgeous, single, and smug, they are also vain.) With the clock ticking down (with 127 days left in the year, about 1/3 for you lovers of fractions), I figured I should stop making excuses and actually see if I can finish in time. Beautiful! Are you going to ply those singles? Or just knit them up like that? 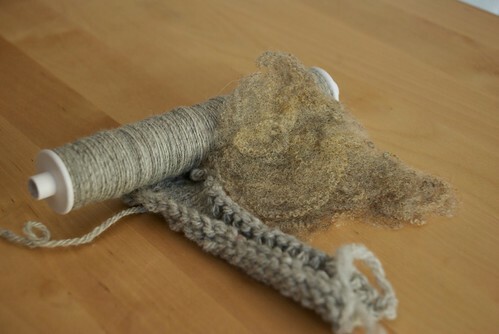 LOVE the way the fleeces spun up. LOVE it. Stunning ... love black sheep! 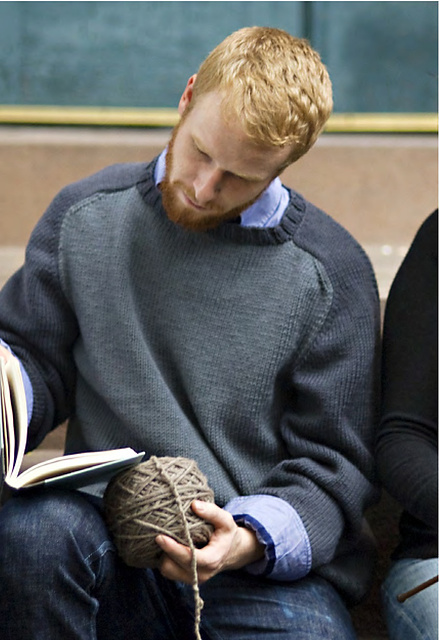 I vowed to knit my hubby a sweater each year. I always try to have the sweater done in time for Thanksgiving dinner but have only accomplished that one time. This year I have to knit last years sweater plus this years sweater. Busy fingers! Your spinning is gorgeous. I can't wait to see how it turns out! Wow...so pretty! 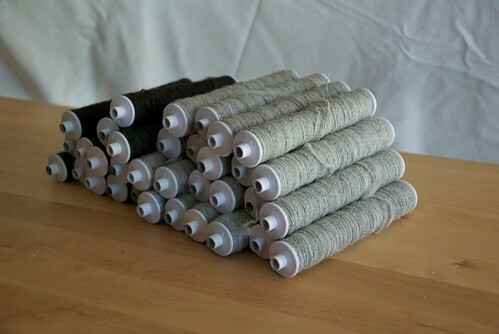 I can't wait to see it all spun up and knit! SOAK also works for stinky kitties who come home after wresting with or taking the life of some prey. Damn you, Jasmin...your podcast (and other factors) have lured me over to the dark side and I have started to spin. And now these fabulous pictures of wool and singles...this is NOT helping me keep any of my mind on knitting.